The original Tour Striker 7 iron has been updated and improved by redistributing the weight in the sole of the club along with a new vibration dampening insert for a better, more solid feel than ever before! The Tour Striker 7 Iron was created for the intermediate to expert golfer who is dedicated to practicing and looking to improve consisency of solid impact. The Tour Striker is the first training club that teaches you the Tour Player's Secret to ball striking. The Regular Tour Striker is targeted for mid-to-high handicap golfers and slower swing speeds (under 90 mph with driver), while the Tour Striker Pro is geared for dedicated practicers with higher swing speeds. 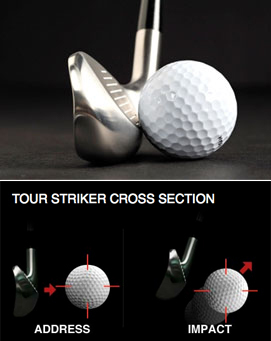 The Tour Striker is the first training club that teaches you the Tour Player's secret to great ball striking! Practice with the Tour Striker will quickly change your understanding of ball striking and will teach you to deliver the club in a descending motion applying a forward leaning club shaft to the ball. You will quickly learn how to get the SWEET SPOT of the Tour Striker under the CENTER OF GRAVITY of the ball, by naturally applying forward shaft lean during impact. We have all heard golfers say, "I hit that one on the sweet spot." That is a wonderful feeling and is generally the reason we make a tee time for our next game. That feeling of striking a ball purely and watching it go to its intended target is very rewarding. The Tour Striker will help you ingrain this feel. Your swing will develop its own successful signature. The more you practice with the Tour Striker the more you will ingrain the correct striking technique and the intent of your swing will change dramatically resulting in a very satisfying outcome The epiphany gained by practicing with the Tour Striker will truly be your own, building on your internal feel and belief system, not the words and descriptions of a well meaning friend or teaching professional. To truly own and rely on a motion, it has to come from within and the Tour Striker will give you this ownership. From here, your creative ability to play golf will flourish. Over the years, we have seen many different swings have great success. Ernie Els and Tiger Woods have traditional swings. Jim Furyk and Lee Trevino have more unorthodox swings. Why do these swing differences produce equally wonderful results? Regardless of their swing style or shape, their impact condition is successful and it is repetitive. The Tour Striker and NEW Tour Striker Pro training clubs have been created not to care about your swing style or shape. The distinctive designs have little clubface below the "sweet spot" like a traditional club (Figure - below right). The clubs have been designed so you intuitively teach yourself how to deliver the "sweet spot" of the club to the ball like an expert ball striker. Transferring the feel learned to your traditional clubs is an easy step! Most golfers do not enjoy the feeling of the club's sweet spot striking the ball. They need certain conditions to be in place when applying flawed impact alignments. Generally, most players prefer the ball to be on a tee, or sitting up in the grass as they try and get under the ball to elevate it into the air. Having this intent leads to an unreliable swing motion. Practice with the Tour Striker will quickly change your understanding of ball striking and will teach you to deliver the club in a descending motion applying a forward leaning club shaft to the ball. You will quickly learn how to get the SWEET SPOT of the Tour Striker under the CENTER OF GRAVITY of the ball, by naturally applying forward shaft lean during impact. We have all heard golfers say, "I hit that one on the sweet spot." That is a wonderful feeling and is generally the reason we make a tee time for our next game. That feeling of striking a ball purely and watching it go to its intended target is very rewarding. The Tour Striker will help you ingrain this feel. Your swing will develop its own successful signature. The more you practice with the Tour Striker the more you will ingrain the correct striking technique and the intent of your swing will change dramatically resulting in a very satisfying outcome. The epiphany gained by practicing with the Tour Striker will truly be your own, building on your internal feel and belief system, not the words and descriptions of a well meaning friend or teaching professional. To truly own and rely on a motion, it has to come from within and the Tour Striker will give you this ownership. From here, your creative ability to play golf will flourish. Note the bulbous leading edge and the missing grooves. Just a quick note regarding the Tour Striker. Mine came in this week and I was able to take it to the range today. I must say that I was impressed. I expected it to help me find that good contact that I currently get only once out of every 6 shots, and it did that well. However what I was not expecting and was pleasantly surprised to find is that it helped me feel how to use my arms equally. I had always believed that the short iron shots were predominately right arm dominant (I'm right handed) and that the long irons and woods were a left arm dominant shot. For some reason with the Tour Striker I was able to feel how to use both arms equally. I could tell when I overpower the swing with my right arm (which now I realize is the cause of me hitting behind the ball). Over all an excellent training aid that I will definitely recommend to my friends. I just wanted to let you know your service is great. Ordered the club on Sunday night and got it on Wednesday. Rushed to the range to hit balls with it and after a little tweaking of my wrists started striping the ball 150 yards with it. I then switched to my Titleist 690.mb 8 iron and hit the 150 yard target at will. You have created a great product. If you plan to do infomercials on the Golf Channel, you better up production. You will sell a bunch. I just tried my Tour Striker iron out the other day. I hit about 15 - 20 balls with it, enough that I started to hit it properly more often than not. Then I grabbed my 7 iron. Just the sound alone of my first strike blew me away. I turned to a friend of mine and just said "WOW! I remember that sound." He said that he thought I was a pretty good ball striker before but apparently not. Shot after shot exploded off my club, took off with a penetrating flight, left a nice even divot and just felt awesome. Some of my members came over to see what we were doing so I let them hit the club. With the S-300 shaft it is on the heavy side but they got the hang of it. Then they took their own clubs and proceeded to smoke em! Just wanted to let you know that you are on to something with this and that I am a big fan. striking the ball and how I SHOULD be striking the ball! I've used the Tour Striker for about two weeks and I think this is one of the best golf training aids ever. It requires no set-up, you actually get to hit golf shots and you get instant feed back, fantastic training club. I received your Tour Striker a few weeks ago and I have to say that it has really changed the way I hit my irons. I always used to throw the clubhead at the ball from the top and ended up casting and flipping big time. On video, my hands would be in front of my right thigh at impact and behind the ball. Just a few solid shots with the Tour Striker and now I know how it feels to have the hands ahead at impact. My wrists are much looser and it seems like my arms and hands are working faster through the impact zone, instead of stalling and flipping. I can totally feel the lag now. I also have the PBS (Pure Ball Striker) and that has helped a little as well. The feeling was pretty easy to transfer over to my regular irons. Great training aid! Pros: does exactly what it is advertised to do. This training club is the best training aid I have ever come across. It does exactly what it is advertised to do. It teaches you to strike the golf ball as it is supposed to be struck. It doesn't get any better than this.
" In The Hole Golf" provides great service and excellent brand name products at the best prices on-line. Pros: Really makes you stay down the line and through the shot. Thanks for great service from all your staff. This product is no joke. It automatically makes you press your hands forward to hit the ball on the sweet spot. If you don't you'll be killing worms along the ground. I love this training aid. I added on average 10 yards on every iron and hybrid club I hit. Thanks again for a great product.